Best Fantasy and Science Fiction: R2-D2 has a new friend! 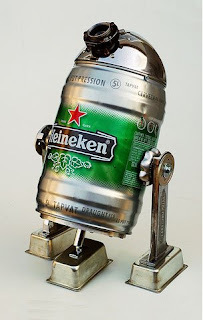 R2-D2 has a new friend; Meet Beer2-D3! This masterpiece was created by Paul Loughridge, aka "Lockwasher". -Head - 1945 chrome BLC utility light shell. -Eye - vintage movie camera lens w/adjustable spring-loaded aluminum casing. -Body - 4.7 liter “adult soda” mini-keg. -Legs - propane tank valve handles, brass spacers, drilled-out washers, pair of aluminum Lady Josephine shoe butler (wall-mounted shoe shine holders). -Feet/base - 3 mini bread loaf pans, lamp hardware and a 1/2″ precision drilled aluminum base plate. +assorted nuts, bolts, screws and, of course - lockwashers! Very cool. He is a "rolling" billboard for Heinekin but the best use of a keg I have ever seen! Imagine the awkward bleeps and bloops he could greet you with as you decide you need a cold one. Someone might just be the life of the party! You can view Paul's Flickr Photostream to see more of his great creations.